Petra Blaisse (born 1955 in London, UK). She studied at Art School in London and in Groningen. 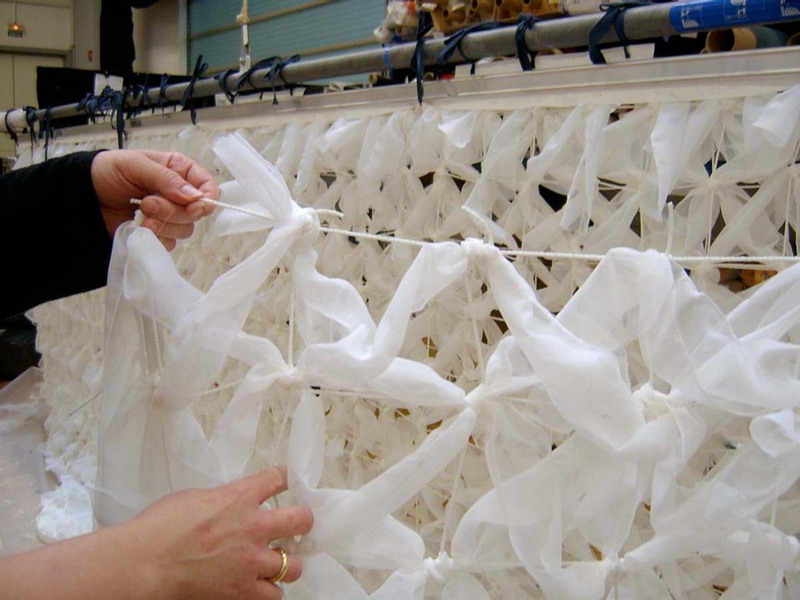 Her work is an intersection of the professions of Architecture, Interior Architecture, Textile Design and Urban Architecture. She founded Inside Outside in 1991. The firm combine expertise in various fields including landscape architecture, textile design and interior design. Petra Blaisse worked in collaboration with Rem Koolhaas and the Office for Metropolitan Architecture on many projects including Seattle Central Library (Seattle, 2004), Casa da Música (Porto, 2001–2005), CCTV HQ (Beijing, 2004–2009).The firm also collaborated with architectural firm SANAA for the glass pavilion of the Toledo Museum of Art (Toledo, Ohio, 2006). 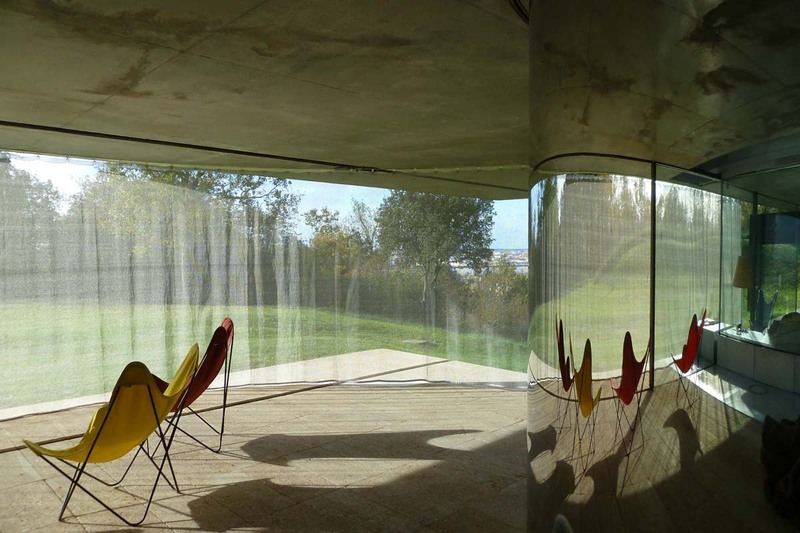 The concept for the curtains in Casa da Música, began through Petra Blaisse’s advisory role as consultant to OMA on interior finishes and colour schemes. 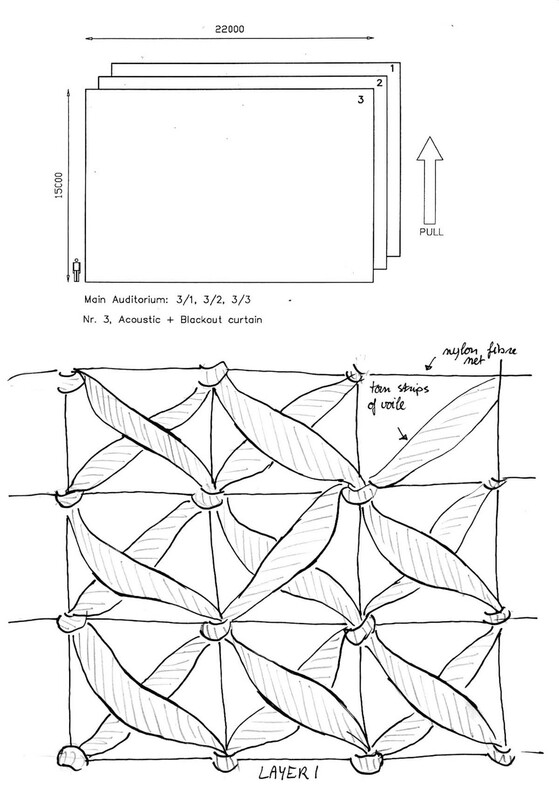 Following this process of consultation, Inside Outside was commissioned to design eleven curtains for the Main Concert Hall, the Small Concert Hall and the Rehearsal Rooms. 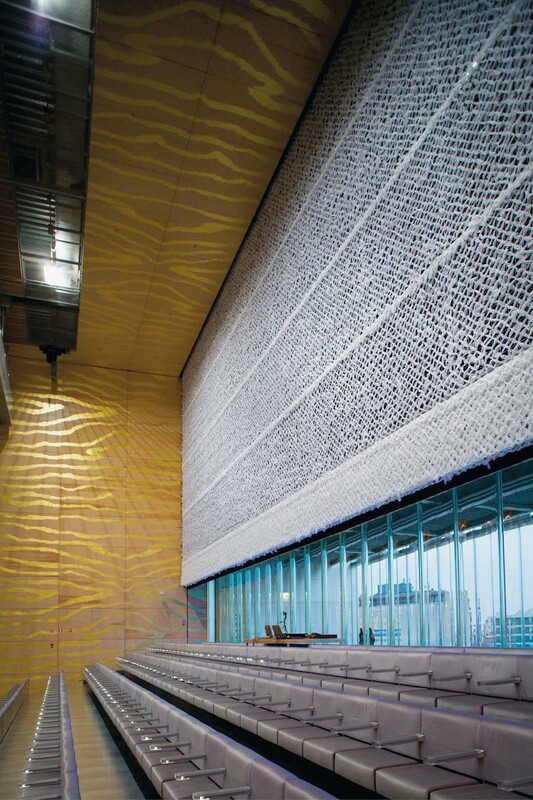 Additionally, Inside Outside provided the design for the ‘golden pellicle’ applied to the wooden wall panelling of the Main Concert Hall. 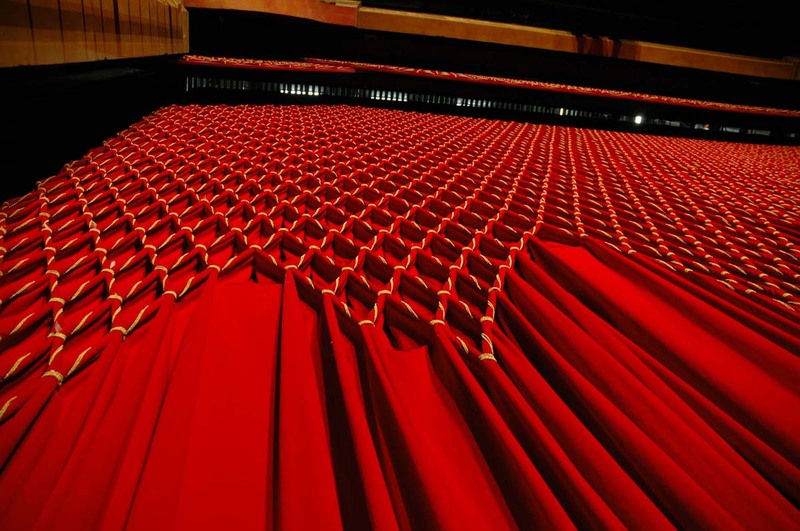 In the concert halls, curtains are steered by motor systems and are deliberately led to hollow walls or cavities above the auditoriums lowered ceilings for storage. Nine of the eleven curtains are suspended over four massive, corrugated glass windows of the two concert halls, which look out over the city in each direction. 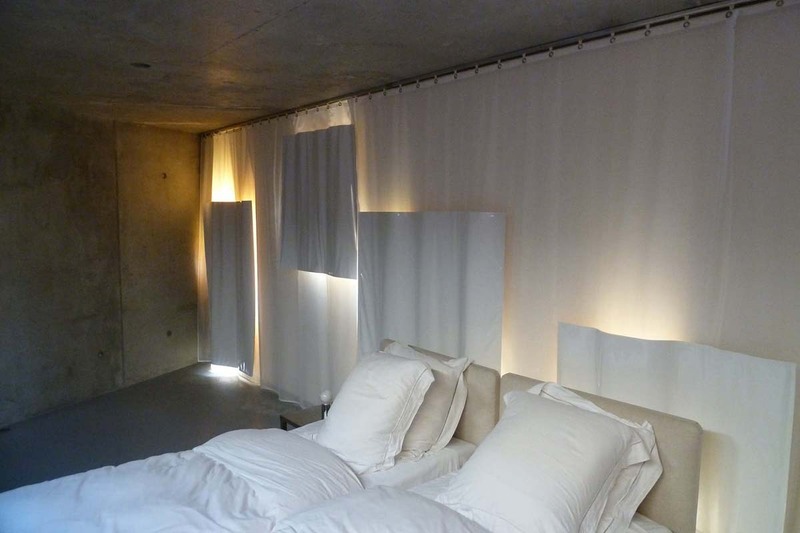 These curtains can be used separately or in combination with one another, organizing light, visual and acoustic issues. 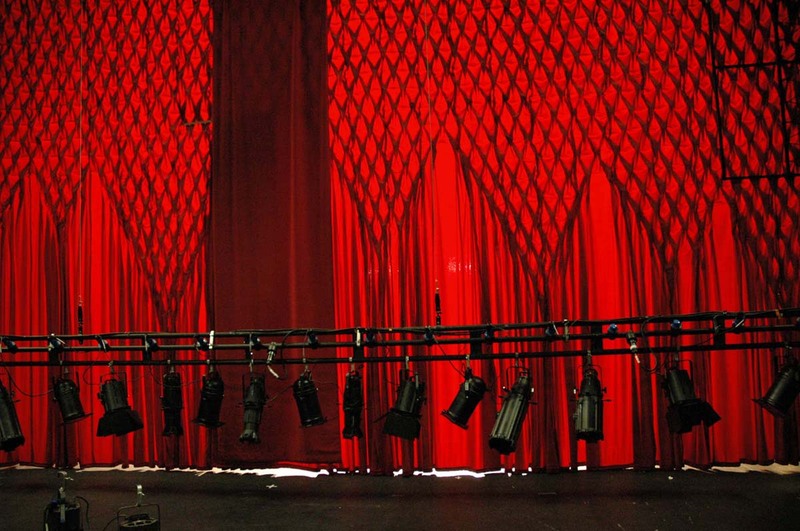 The remaining two curtains cover walls in the underground rehearsal rooms and were designed to meet specific acoustic requirements. 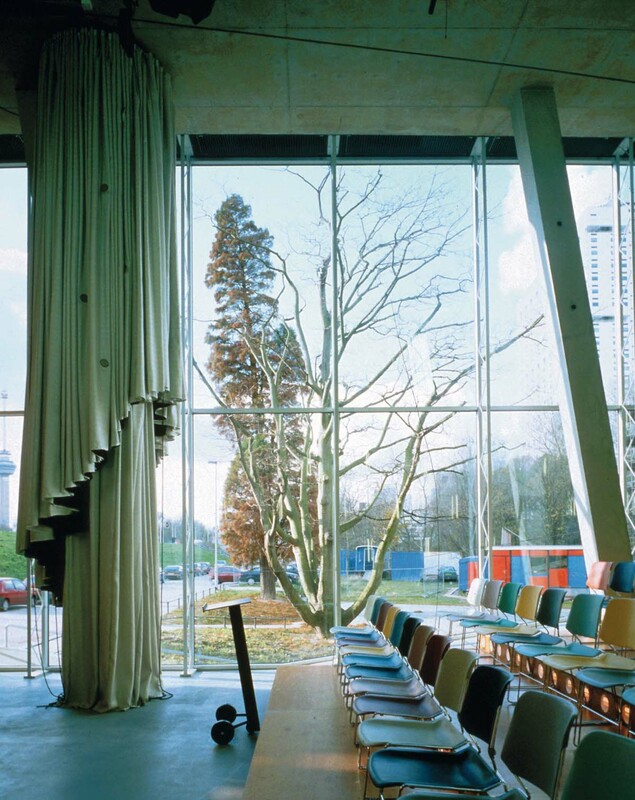 Windows are integrated into the textiles, to allow views from director booths and public areas into these spaces. All the curtains are colourless, which shifts emphasis to texture, structure, degrees of transparency, movement and the effects of layering. 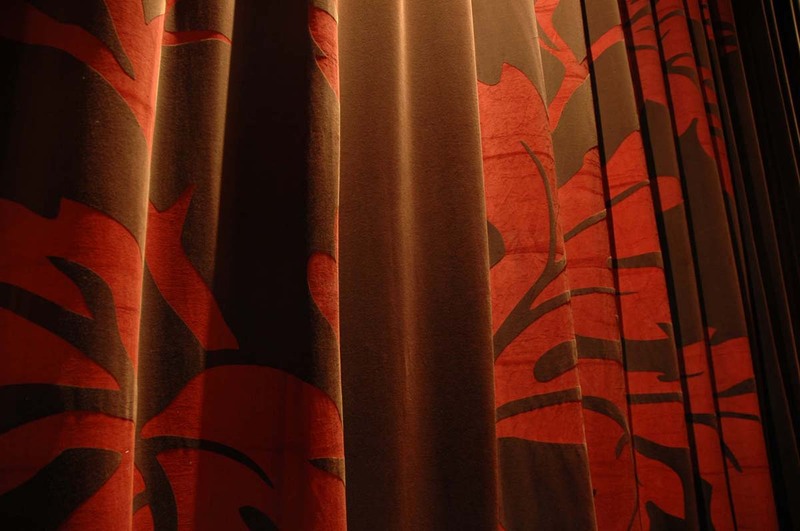 The sizes of the curtains vary from 22m x 15m to 65m x 8m. Next to the interior advisory Inside Outside was also involved in the design of the outdoor spaces of the building. A ‘fluid’ surface of travertine creates a dynamic environment and incorporates stairs, seating, viewing terraces and entrances above and below. 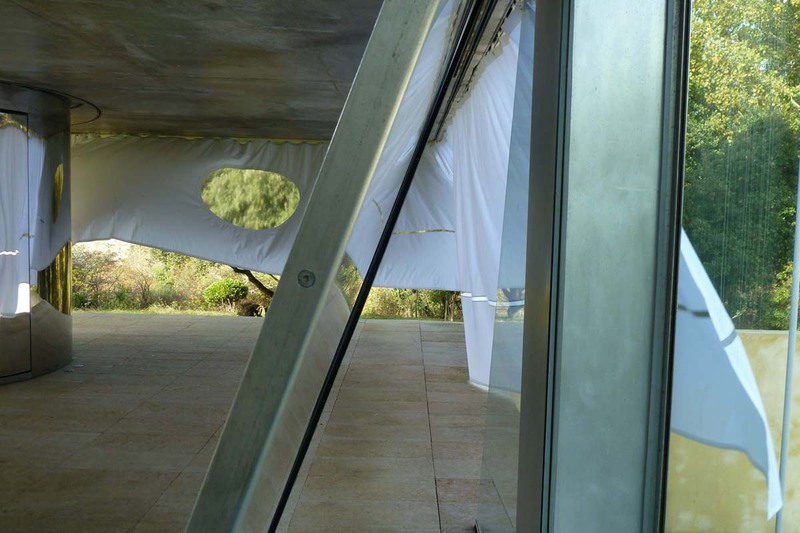 Scope of work: Acoustic, blackout and viewfiltering curtains, sun-screens; advisory for interior and exterior finishes. Team Inside Outside: Petra Blaisse with Anky Adriaanse, Marieke van den Heuvel, Mathias Lehner, Peter Niessen. 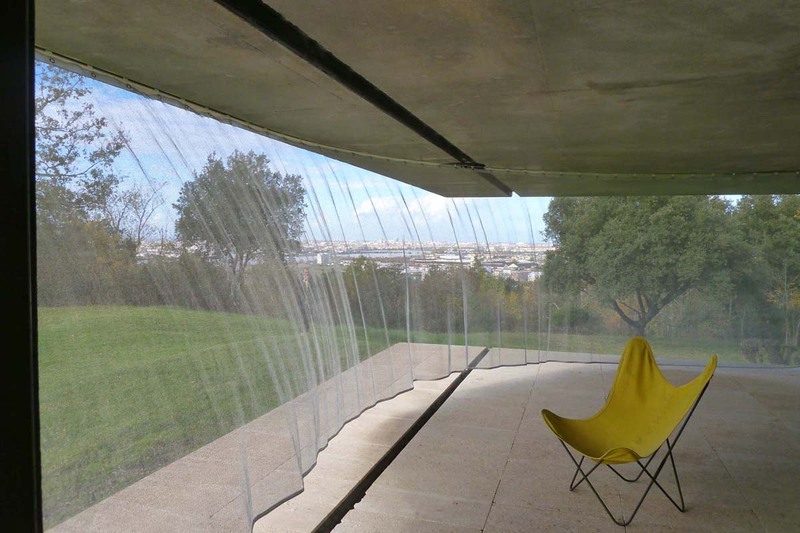 Fifteen years after the original design for several textile and landscape interventions in the celebrated Maison Bordeaux by OMA, Inside Outside was asked to revisit the spaces and reassess their qualities. The house is made up of three stacked volumes, each with their own characteristics. The bottom floor is sunk into the landscape, with an interior courtyard, facing the caretaker’s residence and guest house. 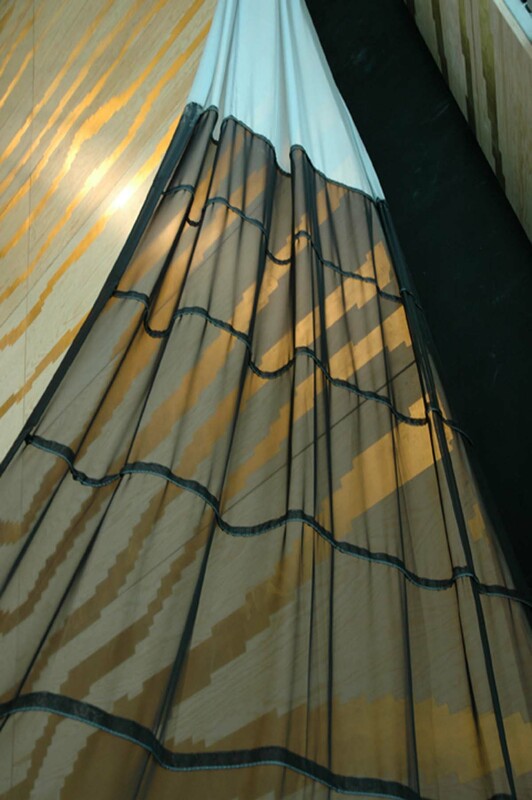 Here Inside Outside introduces a brown and silver, double layered, silk curtain, enhancing the light quality when closed. The middle floor is the most transparent, boasting a huge glass facade. The client wanted to be able to shut out the light coming in from changing angles during the day. A white cotton curtain with a horizontal slit reflects the bright light of southern France outwards and diffuses it inwards. A strategically placed circular window allows the owner to choose the views out to the garden, courtyard and the city as she moves around the space. 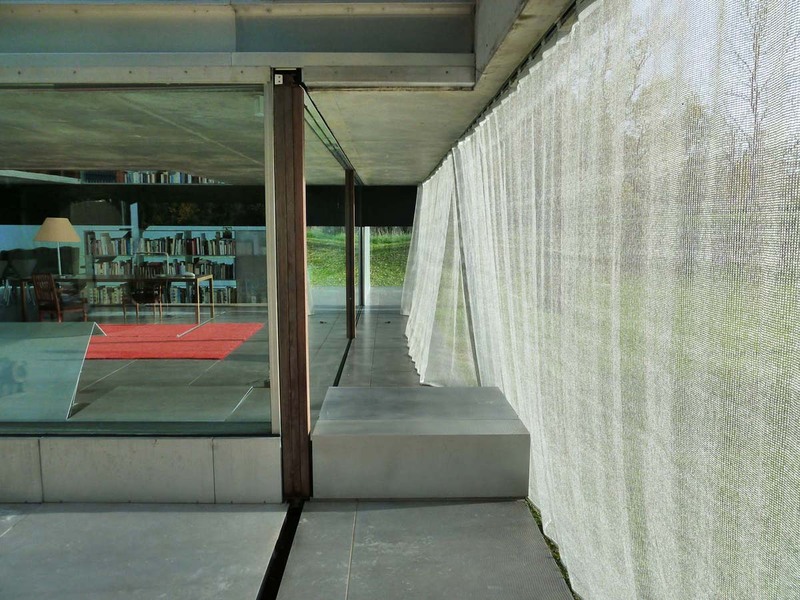 The exterior track on the southern façade is inhabited by a grey net at present, whereas, in its early years, the house was accompanied by a jute curtain .The large net filters the view and the harsh sunlight, creating an extra in-between space on the terrace. 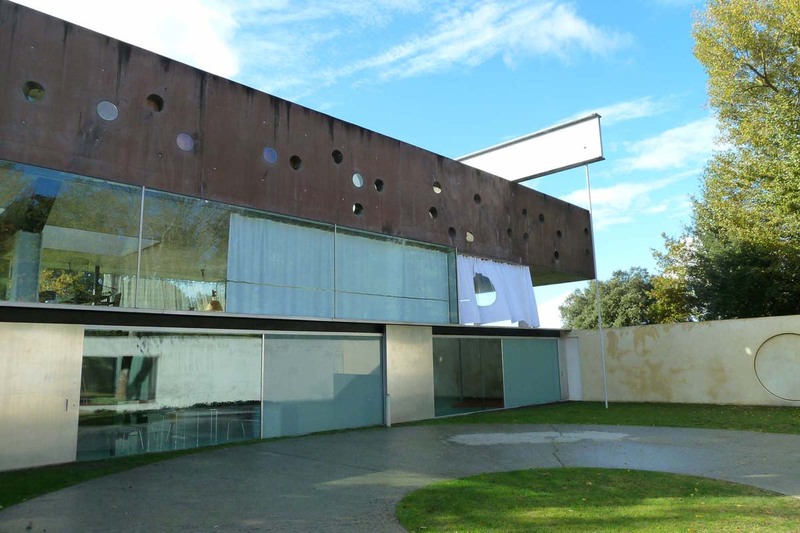 The top floor is semi-transparent, covered on both sides by a large facade punctured with portholes that light up the bedrooms. 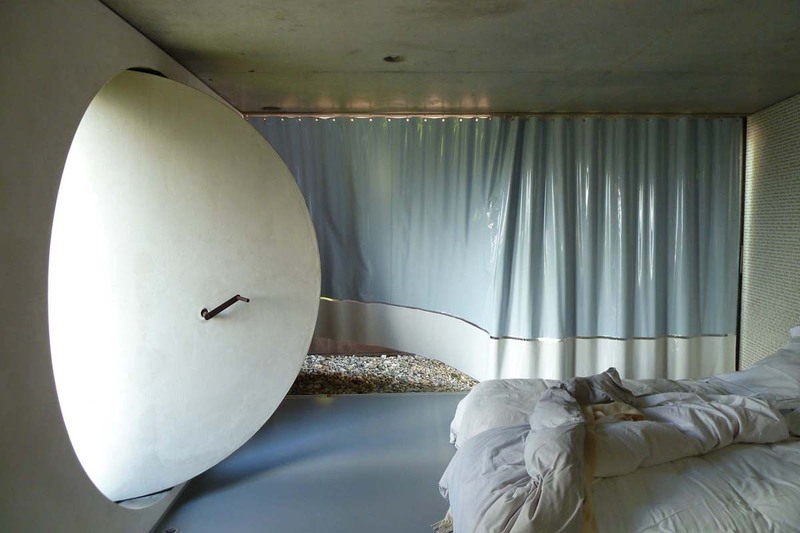 These round windows created an opportunity for Inside Outside to fabricate curtains that respond to the specific architectural conditions. 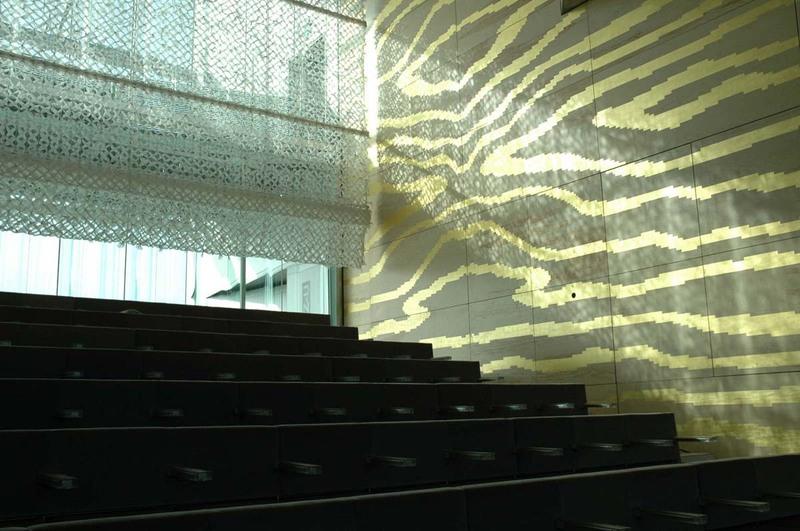 White lacquer patches, lined with gold faux leather floating on a canvas of white voile cover the windows and softly reflect a golden glow on the interior wall. 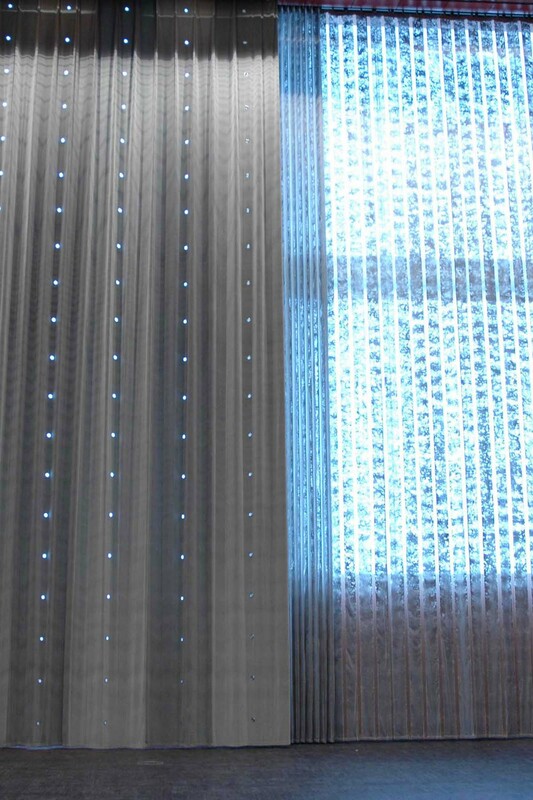 A horizontal slit in light blue and grey lacquer curtains provide a delicate view outwards while the penetrating daylight bounces on the curtain’s oily reflective surface. Thus the three different curtains for three different bedrooms answer to different demands for daylight entry and colour. The element that connects the three volumes is the impressive hydraulic lift that provides a moving ‘room’ through the house. To accentuate the presence of this room, Inside Outside implemented a bright red woollen carpet, that partially covers the platform, and partially lays in the living room, only showing itself in ‘complete’ form when the lift is on the living room level. A second red carpet, with a higher pile, is placed against the curved wall in the media room, as a prelude to the other vertical element in the house, the tube stairwell. Team Inside Outside: Petra Blaisse with Peter Niessen, Barbara Pais and Francesca Sartori. 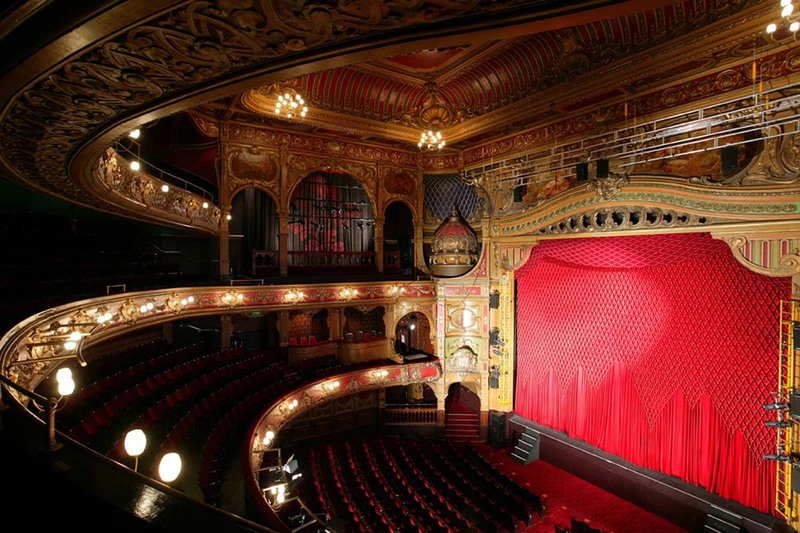 For this renovated variety theatre in London, Inside Outside designed the stage curtains and the upper circle acoustic drapes for the main auditorium, as well as acoustic and light regulating curtains for the new rehearsal studio and theatre pub. The classic forms and the overwhelming number of colours that dominate the old building provide a stimulating contrast to the newly designed portion. Inside Outside’s work addresses this architectural polarity with a variety of distinct designs that vary in colour, materiality and technique depending on the history and function of each space. In the new annex, a theatre pub, a hospitality space and rehearsal studios are stacked on top of each other on three floors. 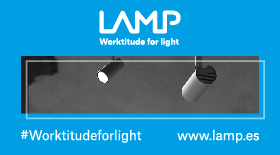 Despite performing different roles, each of the designs regulates both acoustics and light. 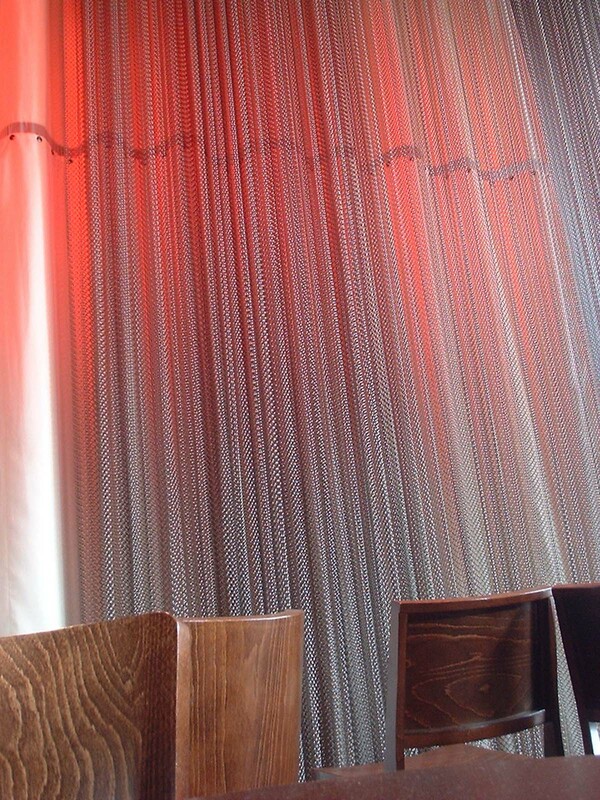 In the pub, large ivory coloured, velvet and satin curtains cover the south and east façades. Their lower half is demountable to ease maintenance and for regular dry-cleaning. 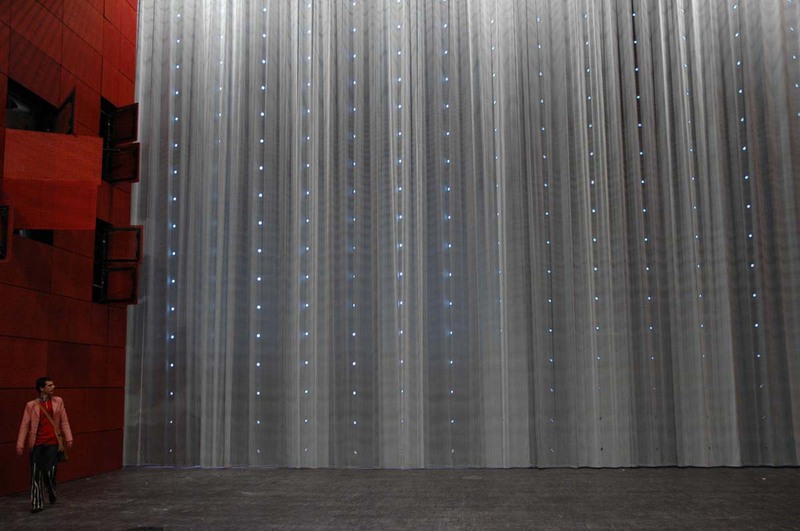 A separate curtain made of stainless steel mesh acts as a backdrop for a small removable stage. It adapts to each colour of the spotlights, as the cloth behind it picks up and diffuses any colour. 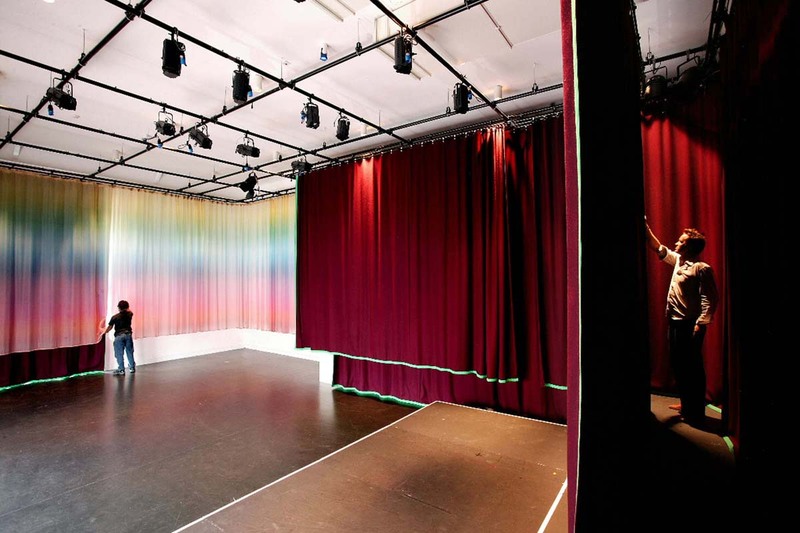 In the rehearsal studio, spiralling rainbow voile defines rooms of various form and size. Team Inside Outside: Petra Blaisse with Anky Andriaanse Lieuwe Conradie, Simao Ferreira, Marieke van den Heuvel, Mathias Lehner and Peter Niessen. 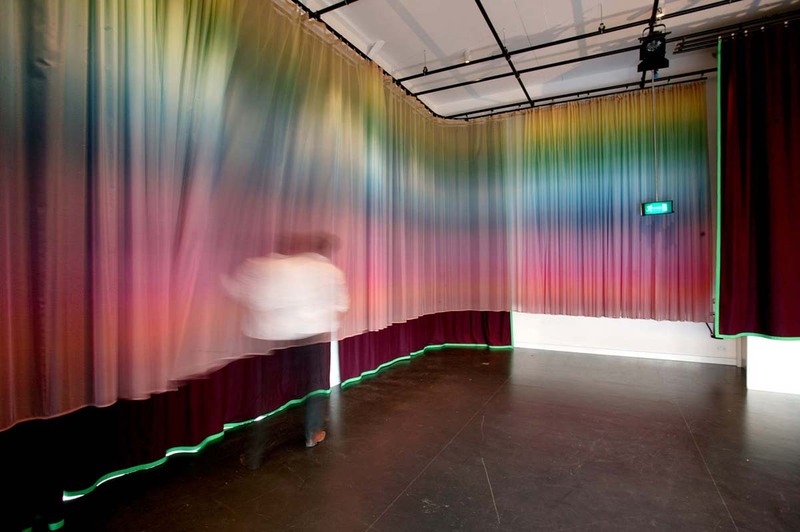 The curtain for this exhibition hall in Rotterdam is a metaphor for a temporary space. 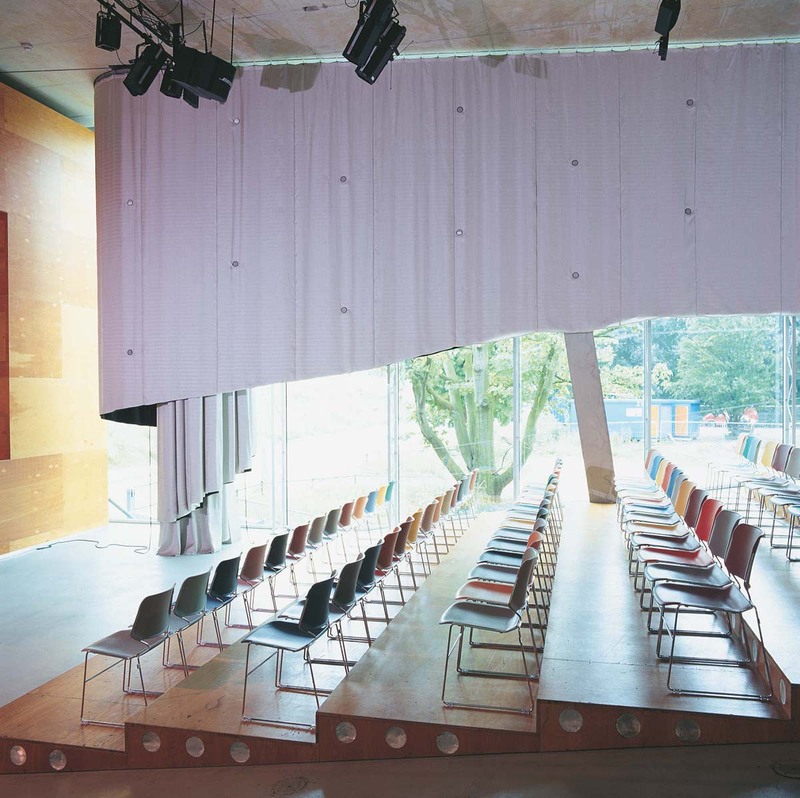 The double layered drape is situated in the Kunsthal’s sloping entrance and auditorium. 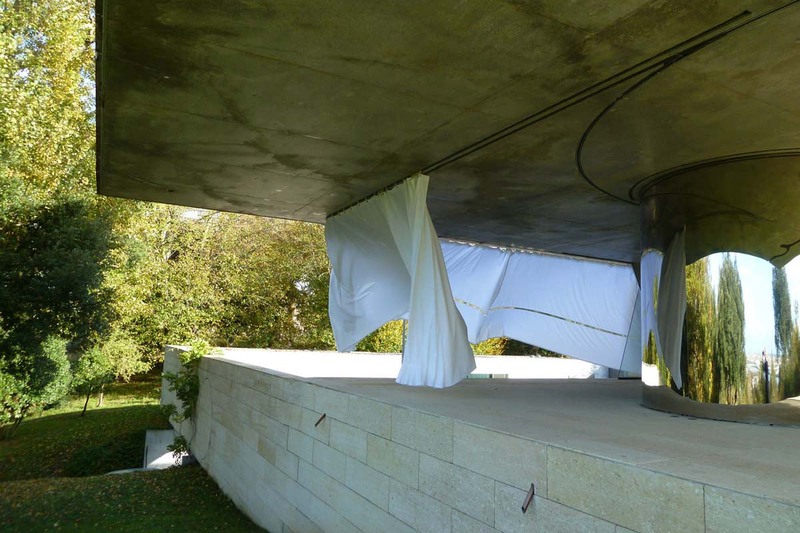 It is not placed between the spectators and the stage or as a curtain lining the glass facade, but it rolls itself out into the space, creating a separate, rounded auditorium – independent of the architectural given form. It’s technical function is to exclude natural light and absorb sound to and from its surrounding – acoustically isolating the space from the rest – and creating a more intimate and smaller alternative to the large auditorium. 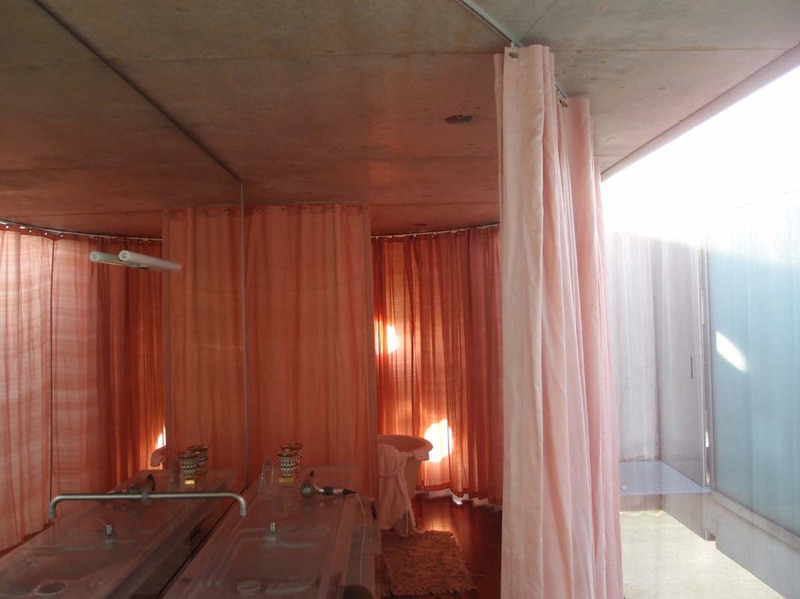 The steel rails carrying the curtain have been moulded into its round and spiralled form before instalment and fixed onto the reinforcement as the spaces’ ceiling was poured-in-place during construction, thus integrating it into the ceiling-plane with a minimal incision. 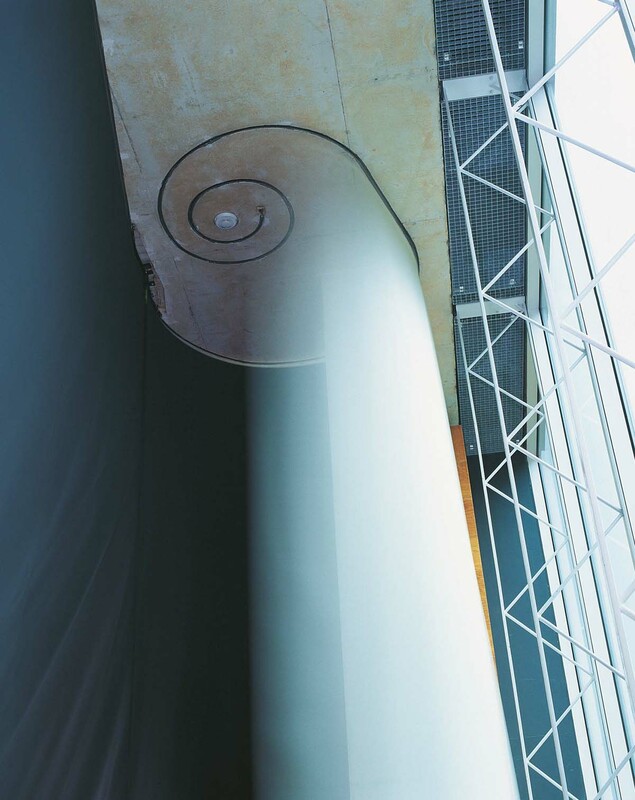 In stored position this double-layered curtain encirkels one of the constructive concrete columns of the auditorium. With its diverse heights dictated by the sloping floor, and its soft-glowing silver glass-fibre cloth turned out, it looks like a sculptural evening-gown. 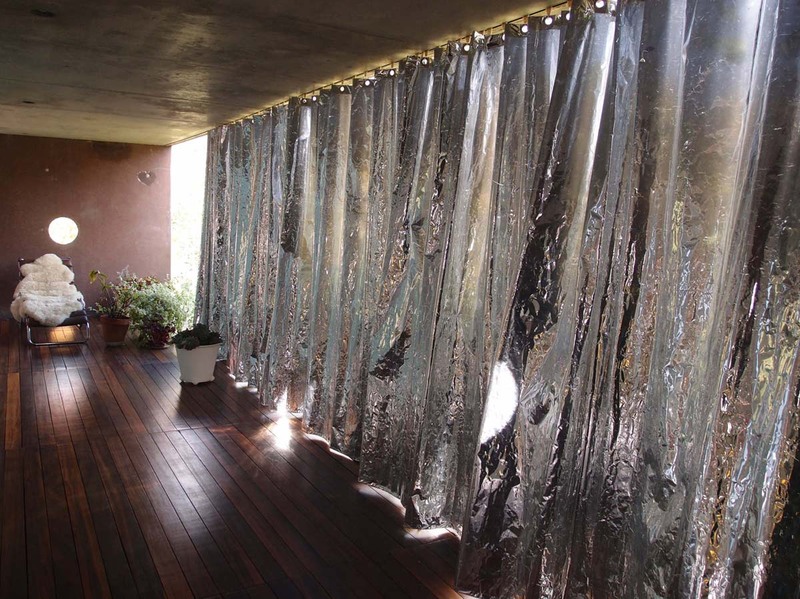 When the curtain is unrolled, it turns inside-out and shows its black-velvet side as the exterior wall. 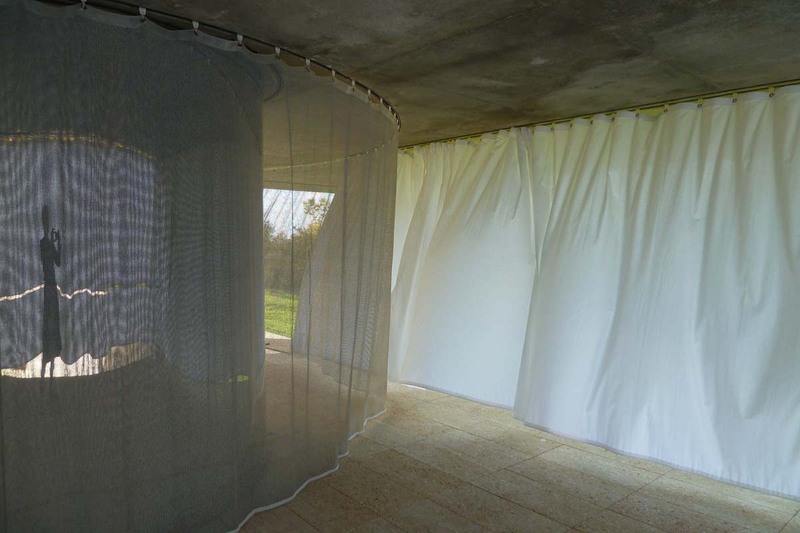 The tent-like interior space that is now created, has its own acoustic atmosphere and lighting. 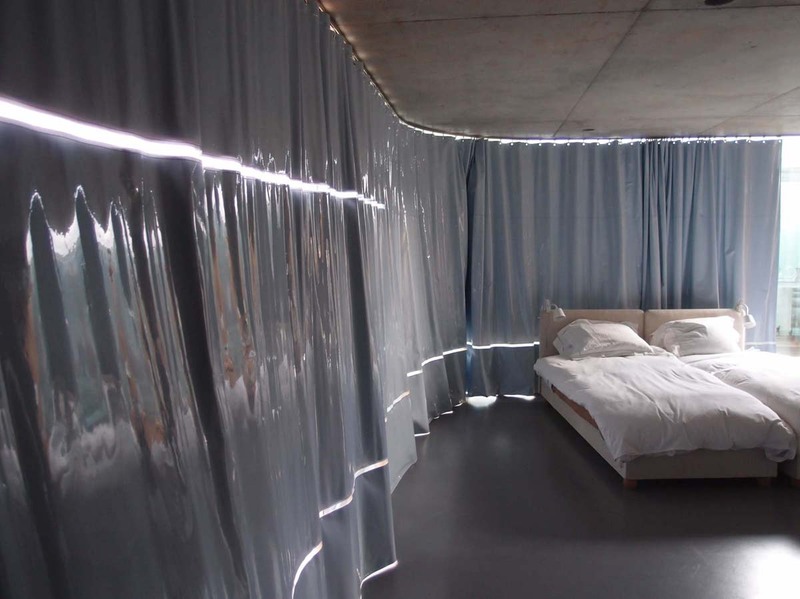 Its silver glassfibre material takes up every colour from its surrounding and functions as a projector screen. 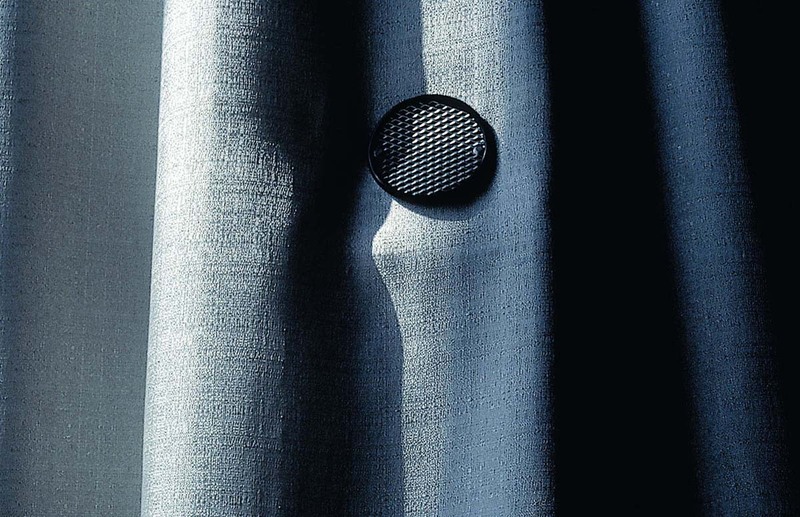 Speakers have been integrated in the curtain, spread in a regular pattern. They are regulated in such a way, that the high tones are transmitted equally into the space. 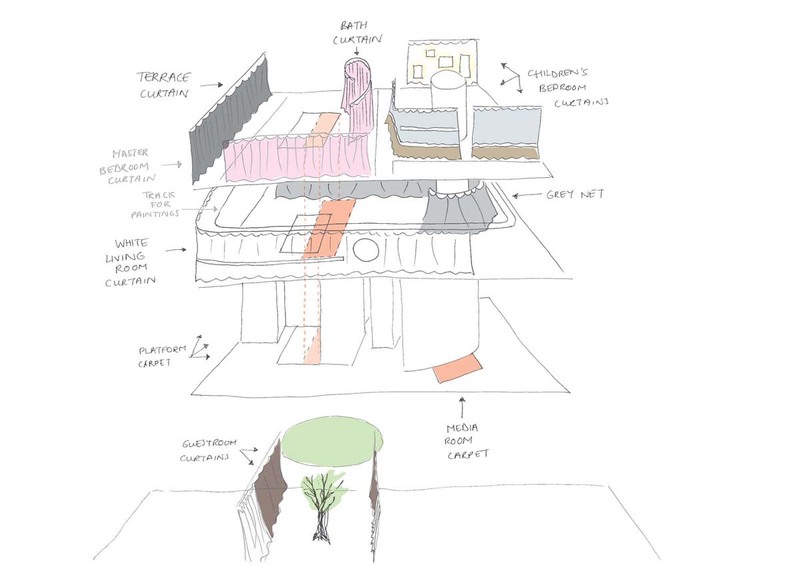 Scope of work: Curtain for auditorium, advisory on interior finishes and green roof. Team Inside Outside: Petra Blaisse.